Could Lab-Grown Meat Be The Future? In 2013 Mark Post, a researcher at Maastricht University, in the Netherlands, developed the first hamburger made entirely out of lab-grown meat. Due to the complicated development process the burger was priced at around $325,000. Now the same burger is priced at $11.36, and a kilogram of meat is priced at $80, because of increased efficiency of production. A traditional hamburger costs between $6 and $9 depending on the location, according to Eater. The process of making lab grown burgers stem cells are first extracted from the muscle tissue of cows. The tissue is then cultured in a laboratory with nutrients and chemicals that help the cells to grow and multiply. Weeks later the millions of stem cells that have been created are put into a dish to merge into small strips of muscle. About 20,000 of these strips are then laid together, colored, and mixed with fat to form the burger. The intricacy of the process caused small-scale production to be expensive at a small level. “Once we can grow the tissue in a reactor the size of an Olympic swimming pool, we should be able to achieve that sort of volume [that allows for prices to be under $10],” said Mark Post. In addition to price, taste was also an issue in the early stages of development. The burgers were tested by Josh Schonwald, a food writer, who declared that they had an “absence of fat” and an “animal protein cake” quality. Researchers are working to improve the taste by including fat cells as well as the muscle cells in the burger. Post says he wants to start selling the burgers in the next five years, at first as specialized orders and later in supermarkets. He plans to do so with a company called Mosa Meat, which he created along with Peter Verstrate, a food scientist. These burgers have numerous environmental benefits. They decrease the land use of beef production by 99%, the greenhouse gas emissions by 96%, and the energy use by 45%, according to the Environmental Science and Technology Journal. The production is also significantly less harmful to animals. With current production techniques, only a small piece of muscle and bovine serum extracted from fetal cows — which will later be replaced by a non-animal source — is used to produce about 10,000 kilograms of meat, according to Mark Post. According to the U.N. Food and Agriculture Organization (FAO), by 2030 the average amount of meat consumed per person per year is expected to be about 100 pounds, and with increased consumption comes increased production. This will only magnify the already-harmful affects the meat industry has on climate change, air pollution, land quality, and biodiversity. 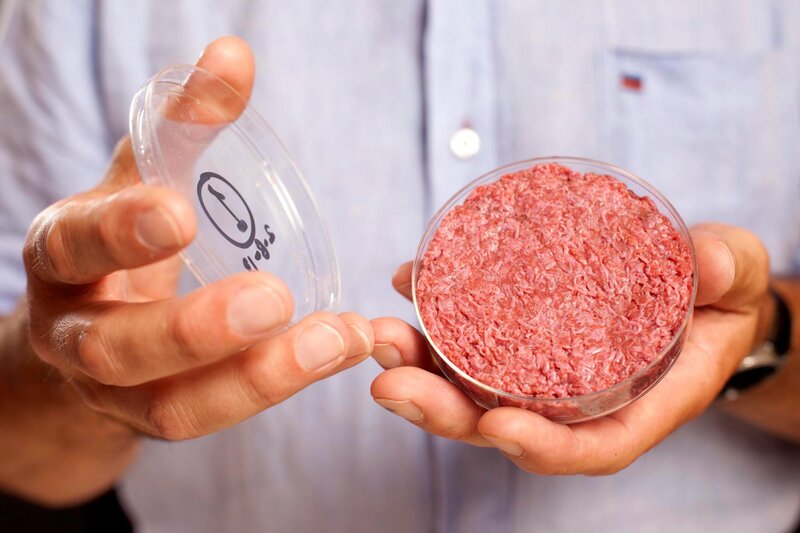 Because the production of lab-grown meat is less harmful to the environment than traditional meat production, it is likely to be more sustainable and thus can keep up with growing demand without greatly harming the environment. While there are benefits, some people are not sure if the burgers would be successful. “I think it’s too big a stretch to expect the broader public or the general consumer to consume beef that has been prepared in the laboratory,” said Tracey Hayes, CEO of the Northern Territory Cattlemen’s Association, a lobbying group in Australia. Whether or not the dissenters arguments are valid is still to be seen, as the product has not yet been tested by the general public. The Scroll Could Lab-Grown Meat Be The Future?